“Now, don’t get wet!” the Middle of the Darling Daughters told her Trio of Rampaging Rascals. We parents often come out with ridiculous exhortations but, I hope my daughter will forgive me saying, this rates high among the silliest. After all, had we not just introduced the Trio to something called a Splash Pad? Moreover, does the Splash Pad not meet up perfectly with my staunch requirement of everything doing exactly what it says on the tin? It’s all in that word: “Splash”,don’t you know? Which is quite splendidly onomatopoeic. 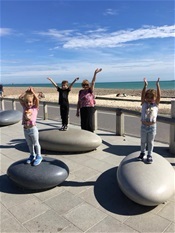 The last time we visited this area of the Worthing promenade, the Splash Pad wasn’t. Splashing, that is. We hadn’t realised that there was a button which had to be pressed in order to set the mini fountains in action. I think I had imagined they would be activated by magic. I am fanciful like that. Despite their mother’s earnest warning, the Rampaging Rascals were truly delighted with the prospect of getting thoroughly wet. With shrieks of excitement they skipped from one fountain to another so as not to miss any. The Splash Pad is a replacement for a former paddling pool and, with all my memories of other grandchildren taking such pleasure in past paddling, I still mourn its passing - but the Trio were only interested in the Here and Now which was offering them so much Watery Pleasure. A small half-naked boy, joined the Trio on the Splash Pad, Lilia taking rather too great an interest in his private parts. Young Faris, who has graduated from Reception Class to the heights of Year One, informed me that these essentials of the male anatomy are known as “Peanuts” at school. Isn’t education a wonderful thing? We finally coaxed three very wet children away from the Splash Pad, remembering too late that we had not brought any changes of clothing with us. Fortunately the sun was warm enough to dry them off beautifully as they ran amok in the Gull Island Playground. We would have played in the East Beach sand pit, which has just one more week until it is packed away for the winter, but we had also left the buckets and spades behind. Considering there were three adults in our party, we had been most careless in our preparations, though - being us - we just went with the flow as per usual. It is better, we always tell each other (usually when we have forgotten something) not to hanker after What Might Have Been. The Middle of the Darling Daughters had messaged me a couple of days ago: “How do you feel about a visit from three RRs and two DDs?” she asked. There really was only one possible answer. So yesterday, the Middle and the Youngest of the Darling Daughters arrived for an afternoon of sunshine and splashery down by the sea, followed by fun in the garden and my famous (prepared in advance the day before) curry dinner so that neither Darling Daughter would have to cook when she arrived home. It was a perfect afternoon all round. Down in Deepest Wales it was a Red Letter day for James, the middle of my (Not So Very Little) Welsh Boys who has reached double figures, yesterday being his tenth birthday. When we arrived back at ours, and courtesy of FaceTime, we sang two renditions of Happy Birthday - one downstairs with Mr B, the Y of the DDs and me, one upstairs with the Rascals who were about to be plunged in the bath by their mother. Why sing Happy Birthday once, I always say, when you could sing it twice? One of the sweetest moments of the whole day was when Tala (the older of the Rascalettes by one important minute) clambered on her Grandad’s lap, put both arms around his neck and stretched herself across him like a contented cat. Mr B was touched beyond words. Poor Mr B misses out on so much these days - yesterday sadly he missed out on all the fun of the Splash Pad and the playground, not to mention the drinks and tea cakes in Coast Café. He didn’t, however, miss out on the love.